You’ve heard all the scares over the past 30-50 years about running out of oil, and may have even been told that there is an energy crisis. Well, there isn’t. However, the featured documentary in this blog post is Aftermath: A World Without Oil. 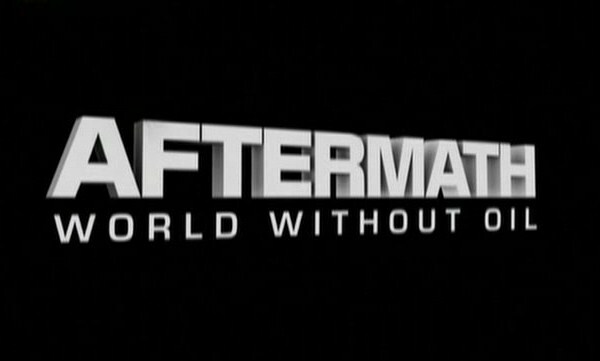 Aftermath: A World Without Oil documentary takes great pains in pretending that somehow we ran out of oil, or better yet, our supply went 50% below our demand for oil here in America. In this mythical fictomentary we look at a well illustrated rendition of what life may be like in the absence of that most precious commodity, next to slave labor & water; crude. Even though we’d kick their asses and they know, Saudi Arabia sells us out on the energy imports. At least in this movie. We fill up our cars at the gas stations for the last time. God No!!! The gas games of 1973 (the oil embargo) is brought up, if only to add credibility to this fantasy flick masquerading as a documentary. They showed lots of pictures of factories/oil refineries. Airplanes became stranded, and people couldn’t travel after our petroleum reserves evaporated overnight. Oil can be extracted from soybeans and turned into diesel fuel. They never pointed out that the earth produces billions, if not trillions, of barrels of oil per day. No need for this type of propaganda. Remember, this video is for entertainment purposes and is listed in the science fiction category. Saudi Arabia goes broke after the black gold miraculously disappears.